Sid Cook and his team at Carr Valley Cheese represented Wisconsin’s Dairyland well, as international cheese experts meeting at the World Cheese Awards 2013 in London, England awarded Carr Valley Cheese ten awards. Bringing home the gold is nothing new to our friends at Carr Valley Cheese. In the past five years alone, Carr Valley cheeses have won more than 400 top awards in U.S. and international competitions. Here are the latest award winning Wisconsin cheeses from Carr Valley’s artisan cheesemakers. More than 250 cheese experts gathered in London at the World Cheese Awards 2013 event to whittle 2,777 entries down to just 58 SuperGold cheeses, as well as awarding gold, silver, and bronze medals to nearly 700 well-crafted cheeses. The cheeses were chosen by a panel of 16 expert judges representing 13 nations. 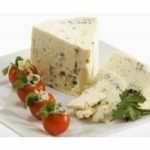 Organized in 1988 by The Guild of Fine Food, the World Cheese Awards has grown into the largest international event of its type in the world. All of us here at WebWise Design & Marketing want to congratulate Sid and his entire team including his cheesemakers and support people for the latest awards acknowledging the skill, pride and care they put in crafting their Wisconsin cheeses and in making it available for everyone. 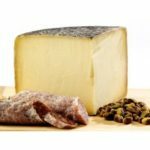 Visit the Carr Valley Cheese retail website www.carrvalleycheese.com or their website for chefs, cheesemongers, and other wholesale customers www.artisancheesesource.com where you may purchase their award winning Wisconsin cheese. Congratulations to everyone in the Artisan Cheese industry for their outstanding 2013 American Cheese Society competition held last week in Madison, Wisconsin! We are pleased to tell you how well some of our clients placed. Carr Valley Cheese, LaValle, Wisconsin, won a total of 13 ribbons including a 1st place award for Bandaged Billy goat cheese. Carr Valley also received four 2nd place awards and eight 3rd place awards. Edelweiss Creamery, Monroe WI, brought home a 3rd place ribbon for their Muenster. Maple Leaf Cheese Coop. received a 3rd place ribbon for their English Hollow Cheddar. Uplands Cheese, Dodgeville WI, won a 3rd place ribbon for their Pleasant Ridge Reserve cheese. The 2013 ACS Judging and Competition was the largest ever, with 257 companies submitting 1,794 different products. What a remarkable accomplishment for these talented artisan cheesemakers! We are privileged and proud to work with several of Wisconsin’s finest cheesemakers providing them an online presence that befits their status. Congratulations to Sid Cook and his team at Carr Valley Cheese, Bruce Workman and his team at Edelweiss Creamery, Jeff Wideman, Paul Reigle and their team at Maple Leaf Cheese Coop, and Mike Gingrich and Andy Hatch at Uplands Cheese. Congratulations to all the winners and participants in the Cheese and Butter Competition at the 2013 Wisconsin State Fair! We especially want to acknowledge the prize-winning entries from our clients. Again, congratulations to all the excellent Wisconsin cheesemakers! Monday, May 20 UW Professor Andy Lewis, Broadband & Economic Development Specialist at the Center for Community Technology Solutions, UW-Extension, led a group visiting the facilities at Uplands Cheese north of Dodgeville, Wisconsin. The group included three members of the Parliament of Victoria, Australia, who are members of the Rural and Regional Committee. They were Mr Paul Wellner (Chair), Mr Geoff Howard MP, and Mr Andrew Katos MP. They were accompanied by Lilian Topic, Executive Officer of the Rural and Regional Committee. I was privileged to participate in this event. Mike Gingrich of Uplands Cheese graciously acted as tour guide. He was a wealth of information and ended the tour with a tasting of the multiple-award winning Pleasant Ridge Reserve cheese. 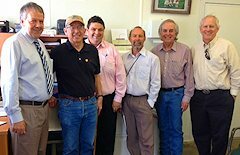 The Rural and Regional Committee members were in the United States as part of their Inquiry into the Opportunities to Use Telecommuting and E-Business in Rural and Regional Victoria. After touring Uplands Cheese, the members of the committee, Andy, and I continued with discussion of the pros and cons of telecommuting and remote working. We also discussed entrepreneurship challenges in rural areas, including broadband access and costs. I related my experience of bootstrapping a small business and over seventeen years of running WebWise Design & Marketing in a small community in southwest Wisconsin. We discussed how a committee of dedicated members (including Andy and me) helped establish local dial-up Internet service availability in 1997 to nearly everyone in Grant County, WI. That local access grew from the city of Platteville only to covering nearly everywhere in Grant County in approximately six month’s time. We concluded the day with a bit of a hike to a rocky point with a panoramic view overlooking Wyoming Valley, followed by dinner at a local restaurant, where our Australian visitors enjoyed their first taste of fried Wisconsin cheese curds. Thanks to Andy and Mike for making this wonderful exchange of conversation, information, and ideas possible. From all us at WebWise Design & Marketing, thank you to all involved in the nominating, selection process, and awarding WebWise Design & Marketing the 2011 Fennimore Chamber Business of the Year. Thank you to all of the Chamber Members who worked so hard on the planning and execution of Chicken Barbeque & Awards presentation. Well done as usual. Thank you to our families, friends, community members, and our WebWise clients for supporting us through our first sixteen years. We feel privileged to work and live in this wonderful area, and to be able to in some small part serve our community. Thank You!